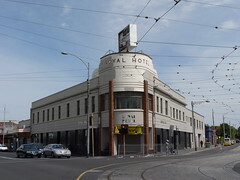 When I was in Footscray the other day I noticed that the Royal Hotel on the corner of Barkly & Droop Sts has been reduced to a shell. It hasn't been looking that good for a few years. 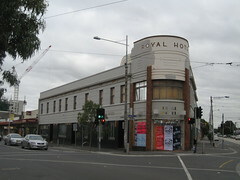 Even when I wrote about it in September 2008 including a photo circa 2005 (below) it looked like the paintwork had not been completed. I believe it will be developed as shops and apartments. Yes, it is now retail shop and cafe. I was past the other day and saw that. Shame it's no longer a pub but I thought it still looked quite good. Thanks for the info, must be a great place to live. 1911 sounds very early for that style of building. I reckon it must have been altered again, probably in the 1930s.